Cover painting: Stephan Lochner, "Madonna in the Rose Garden" (Muttergottes in der Rosentaube), c. 1440. From the collection of the Wallraf-Richartz-Museum Köln. Courtesy Rheinisches Bildarchiv, Köln (Cologne, Germany). Manufactured and distributed by The Dorian Group, Ltd. under license from Música Antigua de Albuquerque. ℗ 1992 DORIAN DISCOVERY. A division of THE DORIAN GROUP, LTD.
Música Antigua de Albuquerque was founded in 1978 in Albuquerque, New Mexico. In recognition of New Mexico's rich Hispanic cultural heritage, the ensemble's first concerts focused on music of medieval and Renaissance Spain, including songs from the 13th-century Cantigas de Santa María and from the "Palace Songbook" of Ferdinand and Isabella. 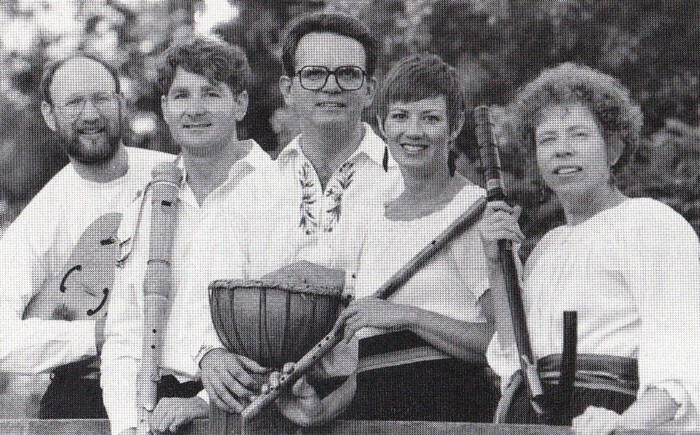 Since then, the group has expanded its repertoire to include music written throughout Europe during the medieval, Renaissance and Baroque eras. Música Antigua presents regular series performances in Albuquerque at Central United Methodist Church and in Santa Fe at historic Loretto Chapel. The members of the ensemble also give tour performances within New Mexico, and enjoy giving demonstrations of early music and instruments both to adult audiences and to students of all ages, from college level down to pre-school. "If it's a magic carpet back to the dark reverence of medieval churches or the drunken revelry of Renaissance courts that you want, Música Antigua de Albuquerque has just the right spell to whisk you there." In 431 A.D., The ecumenical Council of Ephesus proclaimed Mary to be the Mother of God, officially establishing her position in the dogma of the Church. Her prominence grew dramatically in the years which followed, and by the 13th century, the cult of the Virgin had reached its height. This was the age of the building of the great cathedrals and many were the churches, great and small, which were dedicated to her. The adoration of the secular lady, or donna, of the troubadour tradition gradually became the worship of “Our Lady,” Notre Dame, Madonna. Religious orders were established in her name, and cloistered monks poured out a multitude of hymns, poems and prose works extolling her. With the exception of Christ himself, she was depicted by artists more often than any other religious subject. The Virgin Mary became the most honored and beloved of all the saints, the essence of purity, the celestial image of perfect womanhood. As devotion to the Virgin grew during the Middle Ages, the details of her life became more formalized. There now appear to be references to the Seven Joys of Mary, which included the Annunciation, the Visitation, the Nativity, the Presentation in the Temple, the Finding in the Temple, the Assumption and the Coronation. In music, the most popular of these subjects by far were those dealing with the Birth of Christ. 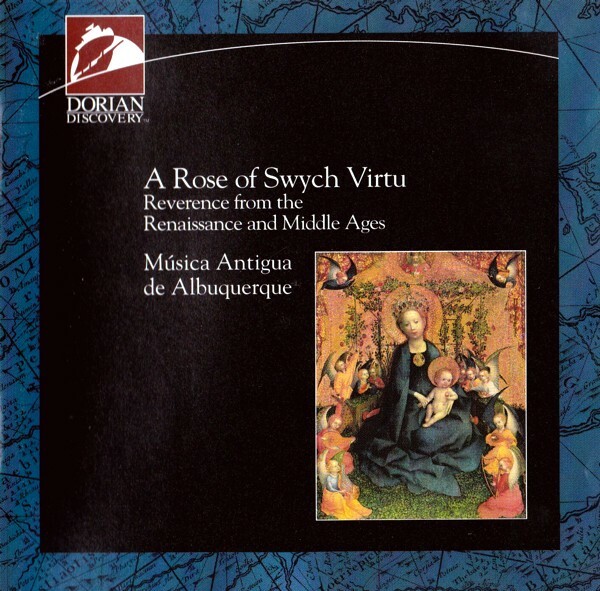 Throughout the medieval and Renaissance eras, these themes provided composers with the inspiration for many of their most joyous melodies and their most fervent expressions of faith. Composers from all of Europe contributed to a vast repertory of music in honor of these wondrous events. From Spain we find songs of praise by Alfonso the Wise, “trobador” of Holy Mary, songs sung by humble pilgrims in the Middle Ages, and charming villancicos from the court of Ferdinand and Isabella. In France, music from religious dramas were first heard reverberating beneath the souring arches of Gothic cathedrals. Chorale settings from Reformation Germany, carols from England, motets by Italian masters, songs intended for school and church from Sweden and Poland—all form part of an incredible wealth of music which today is largely unknown. To explore this treasury is to discover not just the history of music, but also the depth of religious feeling that produced it and the variety of sounds and styles that existed across the Continent. During the Early Christian, Byzantine and Romanesque periods, artists often depicted the Virgin in stiff formal poses, with conventionalized features. By the Gothic era, however, we encounter a much warmer treatment with images of a tender and gentle madonna who smiles and bends gracefully. So too do the musical settings which follow seem to echo this trend. Compare the austerity and symbolism of Gedeonis area or Castitatis thalamum with the simplicity and warmth of a mother’s love in Ach mein herzliebes Jesulein. The chattering of busy midwives in ¡Qué bonito niño chiquito! and the childish wonder of the baby Jesus in Tau garçó, la durundena go hand in hand with a humanistic viewpoint. We present here a reverence from the past, from the awe and mysticism of the Middle Ages to the exuberant joy of the Renaissance. To the medieval Church, the coming of Christ seemed to be foretold not only by the Old Testament prophets but also by the ancient Greek sibyls. The divinations of those pagan oracles are occasionally found in the liturgy of the early church. With the rebirth of the ideas and forms of antiquity in the Renaissance, representations of the sibyls occur in religious art as well, notably in Michelangelo's frescoes on the ceiling of the Sistine Chapel. This chant setting of a sibylline prophecy originated in 10th-century Spain, where it was sung as part of the Christmas Eve service by a priest disguised, appropriately, as an old woman. The message of the sibyl is echoed in this 13th-century conductus, or processional song. Its text is filled with Old Testament references and metaphors for Mary and the Virgin Birth. The "heavenly dew" mentioned in both works derives from the story of Gideon in the Book of Judges. Medieval religious thinkers saw Gideon's fleece as a symbol for the Blessed Virgin, bedewed with heavenly grace when she conceived Christ. And just as the bush burned without being consumed, so did the Blessed Virgin conceive yet retain her virginity. This recounting of the Angel Gabriel's Annunciation to the Virgin Mary is found in one of the most important collections of Spanish medieval music, the 14th-century manuscript known as the Llibre Vermell ("Red Book") which was compiled at the Benedictine monastery at Montserrat, near Barcelona. Montserrat was renowned for its sacred mountain shrine of the Virgin, and many were the pilgrims who traveled to fast and pray to Her there. The Llibre Vermell contains sacred songs and dances for the diversion of these worshippers during their faithful vigils at the Virgin's shrine. English carols characteristically alternated several verses with a "burden," or repeated refrain. Often the verse was written for two voices, and the burden for three. Marvel not, Joseph employs an even greater complexity, making use of both a two-part and a three-part burden, and a verse within which occur sections of both two- and three-part texture. The text, derived from St. Matthew's account, is a dialogue between a doubting Joseph and the angel who appears in a dream to reassure him of his betrothed's chastity. This strophic hymn to the Virgin is from an Augustinian priory in Gloucestershire, and is one of the few works in vernacular English to survive from before the 15th century. Already it displays the English predilection for harmony in thirds, and the beauty and simplicity of style which were to captivate composers on the Continent over a hundred years later. Here may be found a more typical example of carol-writing. The verse is in two parts, while the three-voice burden exhibits the chains of six-three chords which were a hallmark of English harmonic style. Also common in many carols is the inclusion of Latin phrases within a vernacular text. The Monastery of Las Huelgas was founded in the 1180's by King Alfonso VIII of Castile and his wife Leonor of England. The Códice musical del monasterio de Santa Marta la Real de Las Huelgas de Burgos ("Codex of the Monastery of Holy Mary the Royal of Las Huelgas of Burgos"), copied during the first half of the 14th century, was a compilation of music which had been performed at the monastery since its beginning. Castitatis thalamum is an example of the polyphonic note-against-note conductus style, with a melismatic cauda (literally, "tail") on the penultimate syllable of the text. The first syllable of the text receives a similar ornamental treatment. This delightful depiction of the Nativity is found in the Cancionero musical de la Colombina from Seville, a collection which was part of the extensive music library of Fernando Colón, son of Christopher Columbus. Here we are presented with a scene full of warmth and sweetness as two midwives assist at Jesus' birth. They exclaim over the beautiful little baby boy, play with Him to keep him happy, and no doubt help His young and inexperienced mother as she swaddles her child for the first time. Praetorius was the most versatile German composer of his generation, and surely the most prolific. His Musae Sioniae ("The Muses of Sion"), from which this work is taken, contains over one thousand compositions, and forms a sort of compendium of the Protestant chorale in all its various types of settings. Few manuscripts from the repertory of Polish early music still exist, but some sources have survived. Dies est leticie dates from around 1500. A very similar version is found in the Glogauer Liederbuch, a German song collection from circa 1480. This work was apparently intended for solo voice accompanied by two instruments; in this performance we have scored it for three recorders. The most important figure in early 16th-century Spanish sacred music, Cristóbal de Morales served as choirmaster of several cathedrals in Spain, including Ávila, Toledo, Plasencia and Málaga, and acquired fame as a singer in the Papal chapel in Rome. In the dedication of his Second Book of Masses, he wrote, "All music which does not serve to honor God or to exalt the thoughts and feelings of men fails completely in its true end." The depth of his religious feeling is evident in this three-part motet, which begins with the opening notes of a chant which is sung during the Third Mass for Christmas Day. The collection Piae Cantiones was compiled by Theodoricus Petri of Finland in 1582. The songs are from many countries, though the majority are of Swedo-Finnish origin, and of the seventy-four works, twenty-four are for Christmas. Omnis mundus is a Latin hymn, believed to have been composed in the 14th century. This hymn is still in the modem Christmas carol repertoire as Good Christian Men, Rejoice and Sing. Although Praetorius intended it to be sung, it loses none of its joyousness in this setting for recorders and treble viol. Samuel Scheidt is considered one of the best of the first generation of German Baroque composers. During his tenure as court organist in Brandenburg, he published an extensive collection of keyboard works entitled Tabulatura nova. Included in it are twelve canons, some of which seem intended for voices rather than organ. Dancing and merrymaking have long been a part of the celebration of Christmas, a festival which brought warmth and hope to the long and bleak winter of medieval times. Our word carol probably comes from carole, a round dance that was performed at early pagan celebrations of the winter solstice. These rituals later merged with the Christian Christmas, and the word carol came to mean dancing in general, or the accompanying music. The stantipes (estampie, istampitta) was a very popular type of dance in the 13th and 14th centuries. This one is from an English manuscript, and its lively rhythms fit the mood of the festivities associated with the Christmas season. A "great companie" of angels appear to the shepherds in this song from a pageant performed by the Guild of Tailors and Shearmen in Coventry during the 16th century. The phrase "this enderes night" (also often spelled "endris") meant "the other night." In the visual arts, the representation of angels playing musical instruments traditionally denoted felicity in heaven. The words of this 17th-century Spanish song describe to the listener the marvelous spectacle of a host of rather exuberant angels announcing the birth of Christ to the shepherds in the field. Since they celebrate with instruments, so do we. This monophonic song comes from a medieval church music drama called "The Shepherds," found in a Rouen Cathedral manuscript of the 13th century. The play was traditionally performed early Christmas morning following the pre-dawn service of Matins. The text relates the angel's message to the shepherds, and likens Christ himself to a Shepherd leading the flock of Christendom. Little is known of the composer Càrceres, who wrote during the middle and second half of the 16th century. He was evidently from Valencia, for he composed several Christmas villancicos in Valencian dialect. Tau garçó is from his ensalada (medley) La Trulla, a lengthy work written in the same style as the ensaladas of the Catalonian master Mateo Flecha el Viejo, with whom Càrceres apparently studied. La Trulla ("the crowd," "the multitude") is about the shepherds' adoration of the newborn Christ in the manger. The text of this song is a mixture of Valencian, Catalonian and Gascon, and is here paraphrased. From a Polish manuscript, this three-part work was probably composed in the early part of the 15th century. Its text, remarkably concise, describes the gifts from the Three Kings to the Christ child in the stable. To the ancient Medes and Persians, the magi were members of a priestly caste who possessed occult powers, and their "triple gift" was at once fitting for a king and prophetic. Gold, of course, symbolized royalty, and frankincense was used by priests in religious ceremonies. The "myrrh of death" refers to the custom in Biblical times of anointing the body of the dead with fragrant oils for burial. Refusing to be comforted, because they were no more." Giovanni Maria Nanino spent a distinguished career in Rome, serving at various basilicas and churches, and was the most influential teacher of the Roman school of composition known now as the Palestrina style. His works were much admired during his lifetime, but his fame has since been eclipsed by that of his contemporary Palestrina. Found in the Piae Cantiones, this song is apparently modeled on an older work in honor of St. Nicholas. The Cantigas de Santa María ("Songs of Holy Mary") are a collection of over 400 songs in the Virgin's honor, assembled during the reign of Alfonso El Sabio, King of Castile and León from 1252 to 1282). The cantigas are written in a style directly related to the troubadour tradition of southern France. The language used here is Galician-Portuguese instead of Provençal, and the subject matter is now sacred rather than that of courtly love, the idea of dedicating oneself to an unattainable noble lady now transmuted into devotion to the Holy Virgin. Nobre don relates how, when the forty days of her purification were ended, Holy Mary took her Son to the Temple to offer the prescribed sacrifice of two turtle doves and two pigeons. There Simeon, who had been promised by the Lord that he would not die before seeing the Messiah, recognized the infant as the salvation of Israel. This particularly energetic English carol from the mid-15th century is typical in its use of a macaronic text and the alternating two- and three-voice texture of verse and burden. This two-part conductus setting of the Verbum patris has as its lower voice a variation of the same chant melody as that which appeared in the play from Rouen Cathedral. This work is a trope (added words and/or music), used to lengthen the Benedicamus Domino chant which customarily ended the Mass during Advent.